The Great Blue Heron tenuously worked her way up the fish ladder, scanning the rushing waters for lunch. The river was in drought conditions that subdued the usually-robust waterfall to a trickle, and her customary fishing hole at the base of the falls proved fruitless. 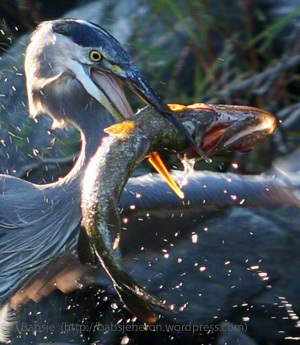 Fortunately for the Great Blue Heron, the ‘no fishing in fish ladder’ policy doesn’t apply to Herons. And fortunately, too, for this photographer who watched the exciting scene unfold. Thanks to Ben H and WordPress for this week’s WPC Challenge: Chaos. Ben has asked for our takes on chaos this week. From a visual perspective, the water tumbling down the fish ladder seethed fiercely. On a more important level, many people experience their worlds as especially chaotic in recent days. Going fishing – whether with a rod and reel and lures or just with a camera – is a small antidote that can bring a few moment of peace. Posted on November 10, 2016, in ardea herodias, Art, Audubon, Bird photography, Birds, Great Blue Heron, Nature Photography, Photography, Photography challenge, postaday, Weekly Photo Challenge, Wildlife Photography and tagged great blue heron, postaday, TCAN. Bookmark the permalink. 9 Comments. I noticed the leg looked scraped up and all the grasses on the wall underneath the feet. Looking more closely the forward foot looks like the toes might be damaged, the other foot looks splayed normally. Is the bird injured? One of the observations of injured birds is that they keep on living life and working despite many injuries. I’d be home in my lazy boy bemoaning my situation probably! Babsje, when I look through Darwin’s lens at this photo I am astonished by the combination of beauty and evolutionary function. In addition to what others have noticed, I see the muscles in her neck. She is made for heavy lifting.